I WISH I KNEW THEN WHAT I KNOW NOW! Don't get to the end of your law school career muttering these words to yourself! Take the first step toward building a productive, successful, and perhaps even pleasant law school experience—read this book! 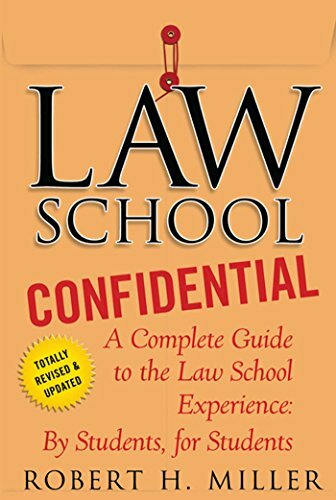 Written by students, for students, Law School Confidential has been the "must-have" guide for anyone thinking about, applying to, or attending law school for more than a decade. And now, in this newly revised third edition, it's more valuable than ever. This isn't the advice of graying professors or battle-scarred practitioners long removed from law school. Robert H. Miller has assembled a blue-ribbon panel of recent graduates from across the country to offer realistic and informative firsthand advice about what law school is really like. This updated edition contains the very latest information and strategies for thriving and surviving in law school—from navigating the admissions process and securing financial aid, choosing classes, studying and exam strategies, and securing a seat on the law review to getting a judicial clerkship and a job, passing the bar exam, and much, much more. Newly added material also reveals a sea change that is just starting to occur in legal education, turning it away from the theory-based platform of the previous several decades to a pragmatic platform being demanded by the rigors of today's practices. Law School Confidential is a complete guide to the law school experience that no prospective or current law student can afford to be without.